The Adirondack Park is a 6 million acre region composed of public and private lands located in northern New York State. The Adirondack Park is the largest wilderness area left in the United States east of the Mississippi River. This relatively wild and remote area lies within a day's drive of the major cities of the mid-Atlantic and northeast regions. 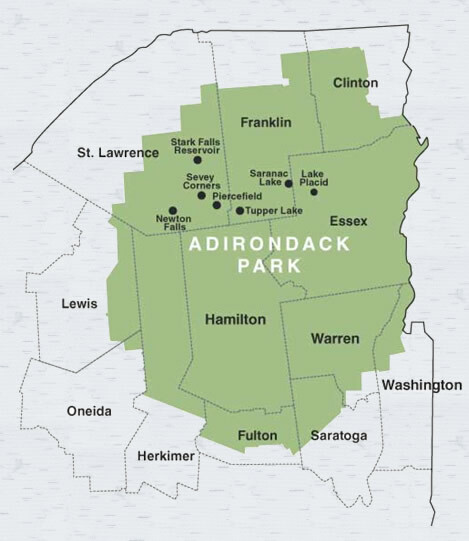 The Park, an area a little larger in size than the state of Vermont, is home to a year-round population of approximately 150,000 people. It's also home to a variety of wildlife, and some of the most spectacular scenery and wild public forest lands to be found anywhere -- land that will remain "forever wild" under the protection of New York State's Constitution. With thousands of lakes, numerous mountain ranges with 46 peaks over 4,000 feet, countless rivers and streams, miles of unbroken forests and small, friendly communities, the Adirondack Park makes an ideal place to enjoy the "quiet life," raise a family, and experience the beauty of this outdoor paradise. If you'd like to live, work or play in the Adirondack Park, Gillis Realty is ready to help you search out that perfect property to meet your needs!